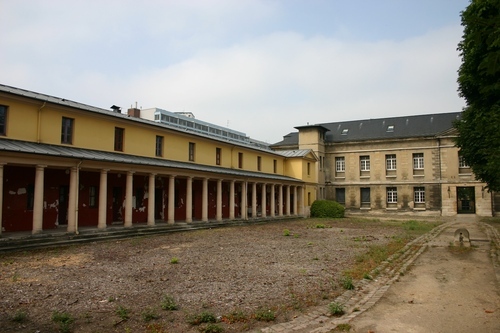 La Cour des Massacres (the massacres court) is the place, inside Bicêtre Hospital in Paris, where Joseph Ignace Guillotin first experienced on some corpses his new instrument for capital punishment, the Guillotine, on April 17, 1792. Also Philippe Pinel and Pierre Jean Georges Cabanis attended the experiment1. Later on, that same year, almost two hundred people were executed in that same court. The buildings that now surround the court date back to the 1820s. 1. See French Wikipedia (last visited 2 November 2014).